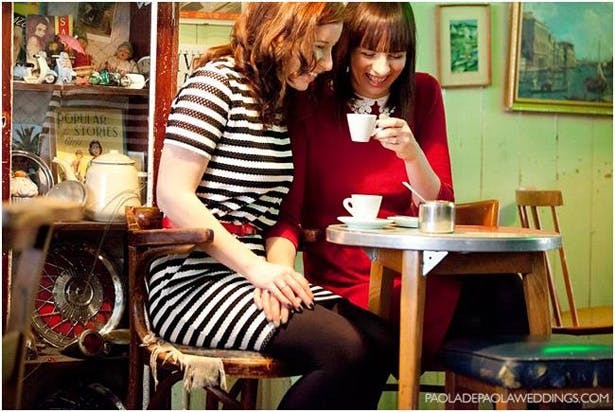 To celebrate the one year anniversary of the legalisation of gay marriages in England and Wales, we’re thrilled to share Karen & Sara’s coffee shop engagement shoot; captured by the very talented Paola of Paola de Paola Photography. 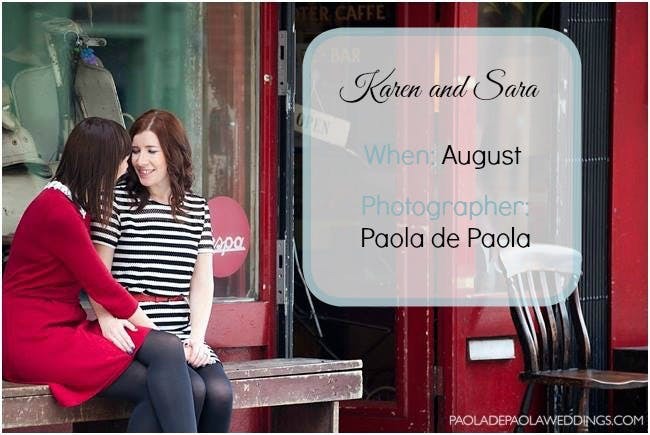 We love the style of this shoot so much that we can’t wait to see Karen & Sara’s big day! It’s amazing! It feels so wonderful and exciting. We didn’t realise it would make our relationship feel so much stronger. We are very much enjoying being engaged and are pleased that we didn’t rush to get married straight away; it’s such an awesome period to just enjoy being all loved up. Sara: I was adamant that I wasn’t going to be the one to propose, so much so that it was a joke between us and between friends. I changed my mind when I realised how special it would make her feel if I were the one to propose, so I began plotting. I faked a plan for a weekend away in Scotland and told Karen to pack accordingly. Unknown to her, we were really going to Venice! I had to secretly smuggle her summer clothes in my case so she would have suitable attire when we got there. After a day looking around beautiful Venice, I had arranged a sunset gondola ride and popped the question on the canal whilst we were enjoying a Bellini and the view of the Rialto Bridge. It may sound cheesy but it was perfect for us and we spent the rest of our weekend in Venice on cloud 9, celebrating! Karen: It was a surprise. I think I’m the only person ever to take woolly socks to Venice in August! I didn’t even realise what was going on when we boarded the gondola! I had always thought I would be the one to propose and, in fact, had already designed and ordered a ring for Sara and was making my own plots to propose to her. She just beat me to it and totally stole my thunder! Karen: It’s perfect and I love it! It’s a platinum band with a central princess cut diamond and two flanking pear shaped diamonds. I love the sparkles! Sara: Karen counter proposed so to speak not long after Venice. My ring is beautiful, it’s a platinum band with 3 emerald cut diamonds, the central one being the biggest. It is modern but with an art deco look. It gets a lot of compliments from strangers on my commute! Immediately after the proposal we went to the famous Harry’s bar in Venice and had Bellinis to celebrate, in the place they were invented. We then went for an amazing dinner with a bottle of our favourite wine, topped off by the biggest glasses of limoncello you’ve ever seen. We spent the whole weekend in Venice celebrating – and haven’t really stopped since! At home, we had an engagement meal to celebrate with our friends. People came from all over the UK and made us feel so loved. We had an amazing, huge tapas meal followed by too many cocktails and dancing in SoHo and Covent Garden. What a night. Our wedding is 13th June 2015 in Italy, though we need to have a legal ceremony in the UK first. We have hired the Frassanelle estate in the Veneto region and there will be around 50 guests coming to join us in Italy, some from as far afield as Canada and Australia, which is very special. Our ceremony will be held outside in woodland on the estate, followed by plenty of amazing Italian food and drink. The theme is informal and rustic but with some elegant touches. The bridesmaids, Laura, Sophia and Kelly, will wear blush Vera Wang chiffon dresses – we love the colour so much it has become the colour theme for the whole wedding. Sara’s niece, Holly, is our flower girl and will no doubt steal the show. Sara’s dress is a couture design by Andrea Bambridge of York, Karen’s dress is Essence of Australia from Angelica Bridal Islington. Both dresses are being kept secret so that is all we can tell you. Our legal ceremony will be very intimate and will take place at Crab Manor in Asenby. 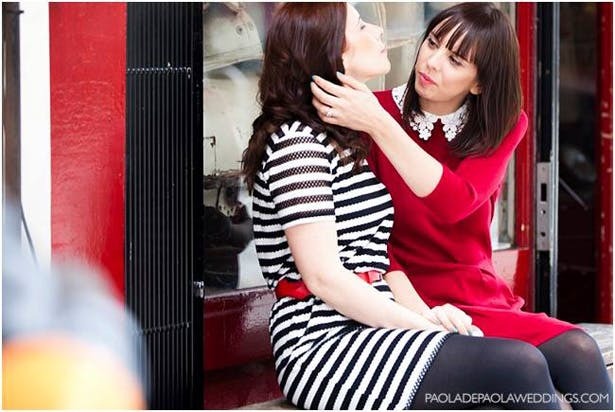 The amazing and very talented Paola de Paola photographed our engagement shoot and will also fly to Italy to photograph our wedding day. Cristina Pala was our hair and make-up artist and made us look beautiful! Karen: We were both a bit nervous and didn’t really know what to expect but Paola is so warm and patient , she soon made sure that we relaxed and I really enjoyed the whole experience, even though I usually hate having my photo taken. We had loads of fun. 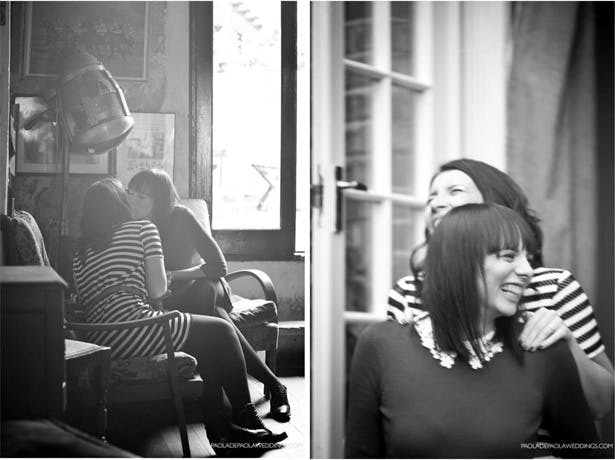 The photos are amazing, we love them so much – Paola really captured the very special love between us. Sara: I was probably the most nervous but Paola is such a professional and an amazing artist, she really guides you through the shoot. We chose Paola as she is so passionate about her art and about making sure your day is so special – her photographs are beautiful, quirky and have such soul, they really stood out against the crowd. Working with Paola just feels like working with a friend and that really helps! We didn’t want staged photos so didn’t have a theme as such and opted for candid shots. 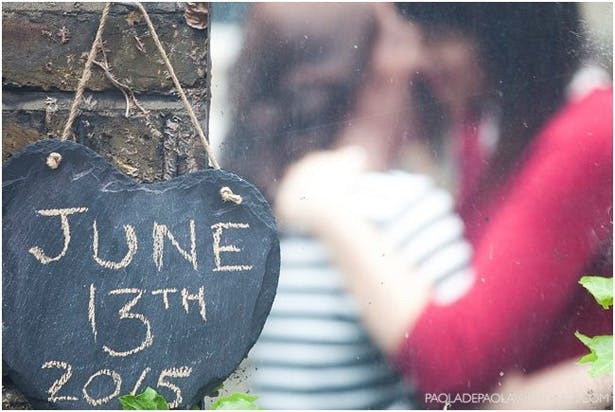 The shoot took place at our home and in our tiny London garden and it was really lovely to have the shoot in a place that means so much to us and in which we’ve had so many happy times. Starting at home also gave us a chance to relax! 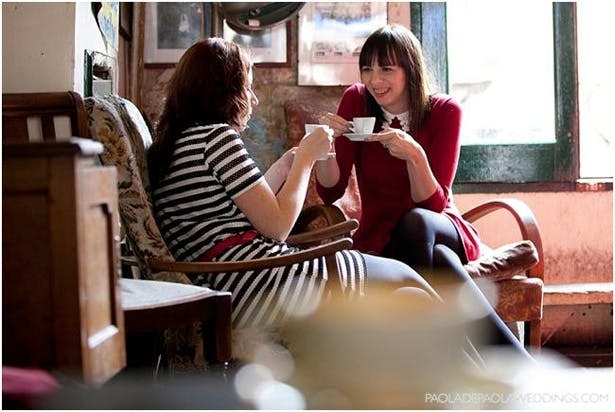 We then visited a quirky local coffee shop that we love and some pictures were taken there. It was great to have more than one location!